On my recent trip to Kauai, I was spoiled by the wide availability of fresh turmeric, so much so that I created a daily ritual of turmeric tea. Research comes out every day linking turmeric to decreased risk of cancer and to improved brain health. Adding a daily beverage made with fresh turmeric may be just what the doctor ordered — and a great “Good Day Strategy” that I love to talk about. I know I felt great at the end of my two-week stay in Kauai but, of course, that was likely due to quite a number of reasons (rest, sunshine, exquisite fruit, all things I desperate hope to experience again one day…). Increasingly, fresh turmeric is available in health food stores in the United States and so I am able to get my fix at home as well but availability is a bit limited. I take what I can get and consider fresh turmeric a luxury until I manage a dedicated green house situation to grow it here on the property. Fresh turmeric has a stronger flavor than you would expect give the dehydrated turmeric powder. The powder can be added to just about anything, particular in curry-type dishes, and you may notice only the vibrant color change. Fresh turmeric has a slightly bitter bite. The flavor is good but it is unique — it is worthy of experiencing it yourself before you dedicate a protected area of your garden to it, as I am about to do. To make turmeric tea, you simply make an herbal infusion as you would any other herb or root. In this case, I simply added a couple of inches of turmeric, sliced, to a few cups of water. I brought it to a boil, let it simmer for a half hour or so, and then put the lid on and let the turmeric tea mixture sit over night. 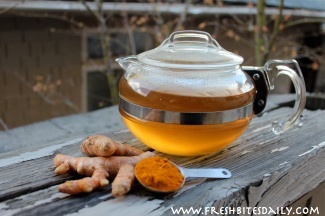 Warm your turmeric tea infusion up in the morning, dilute it to taste, and add a bit of honey. Turmeric tea on its own does not have the best flavor and you will seek out ways to improve it. 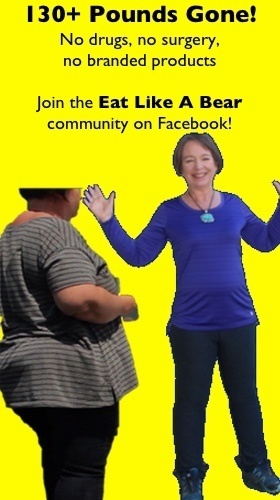 Here are two ideas for you. 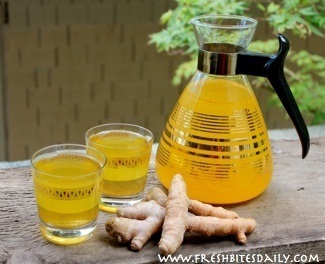 Make your turmeric tea infusion (above) with half ginger. Ginger has great health benefits as well and an much better flavor, a flavor that will complement the turmeric and make this tea quite pleasant. Sweetened with honey, you will be reaching for more. I have enjoyed using a diluted infusion (about half water and half turmeric infusion) as a base for black tea. Using my favorite Earl Grey tea or, more thematically, a chai-like tea, I heat the infusion to nearly boiling and pour it in my cup over my tea bag. The tea is a richer drink with a little more body and wonderfully satisfying on a cold morning. You could use the ginger idea above in combination with this black tea idea as well. If you are using dried turmeric powder, you can reduce the bitterness of the powder by boiling it, so you would want to pay attention to your water temperature if you find your tea to be bitter. This third point may be the most important and explain a lot of bad experiences with this drink. Check out this taste test from the Half Pint Hacks — the youngest generation here at Fresh Bites Daily. If you tire of your standard turmeric tea recipe, Numi makes several very good turmeric teas. The Half Pints taste them in the video below. Much like ginger, you may be tempted to use fresh turmeric in your cooking and carefully peel around all of the little nubs leaving as much fresh turmeric root as possible. It is tedious work. Don’t do it! Rip through the root, slicing off the nubs and skin. Set them aside for your tea project and use the remaining peeled root in your cooking. To make a turmeric tea from a powder, we really like this turmeric tea paste idea (here). It is simple, convenient, and portable. 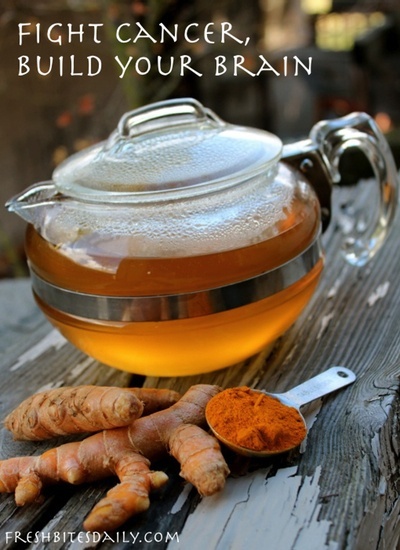 Build your health with this traditional turmeric tea, golden tea. Learn the secrets to less bitterness from the turmeric in your turmeric tea. Thin slice two inches of fresh turmeric and ginger. Add turmeric to 3-4 cups of water. Reheat the mixture when you are ready for turmeric tea. Dilute the turmeric tea infusion to taste. Sweeten with honey. Remember too that this tea is great iced. Make your infusion and perhaps sweeten it while it’s warm. Let it sit overnight and then refrigerate it. Drink it cold. The epic turmeric post: Uses, research, recipes, and more. Find it here. Golden milk made with turmeric powder and some simple flavor options to help it come alive. Find it here. Turmeric tea paste, a great option for making tea from the powder that is also portable and easily taken on the road. Find it here. Roasted cauliflower with turmeric here, combining great foods into one recipe.